Toni Latour is an East Vancouver queer feminist artist. She works in photography, installation, text-based practices, drawing, video, sound, public art, and performance art. 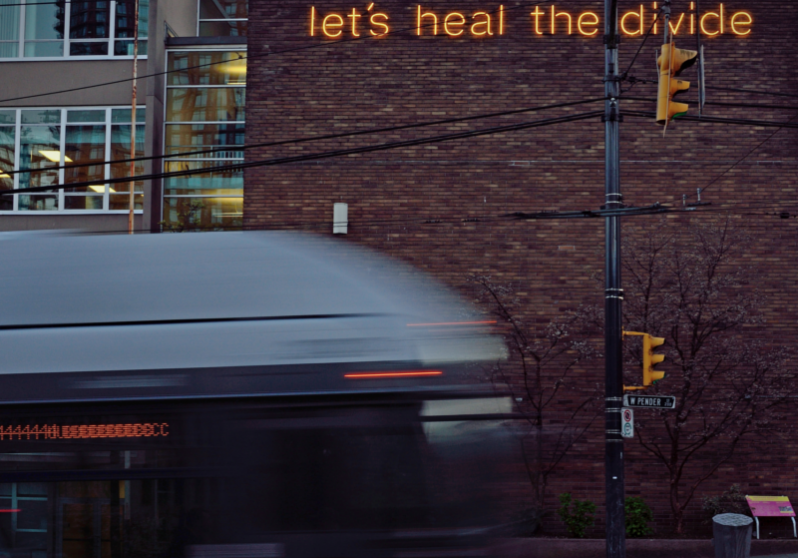 Latour received her BFA from the University of Windsor in 1998 and her MFA from the University of Western Ontario in 2000.
let’s heal the divide, a site-specific work for the Downtown Campus of Vancouver Community College (VCC), reflected upon the history and current conditions of Vancouver and addressed the socio-economic, political, and cultural points of disconnect present in the area. The use of neon in this work echoed Vancouver’s history. At its height in the 1950s, our city was home to nearly 19,000 neon signs. Subverting the commercial use of this one-time ubiquitous medium, the artist sent an alternative message through the warm glow. With an environmental consciousness, neon was chosen for its energy efficiency: the sign cost approximately $100 a year to light. 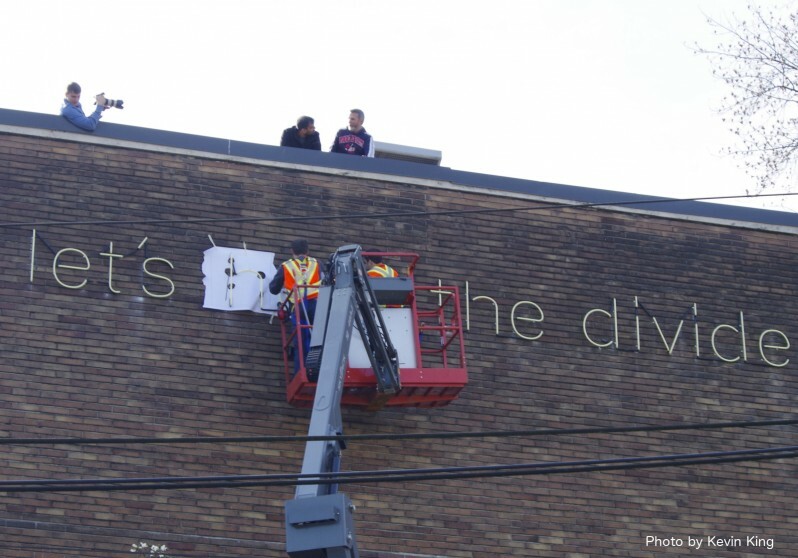 During its temporary installation on the façade of the VCC building, the neon artwork marked a physical division between the Downtown Eastside and the commercial and financial districts that border this neighbourhood. 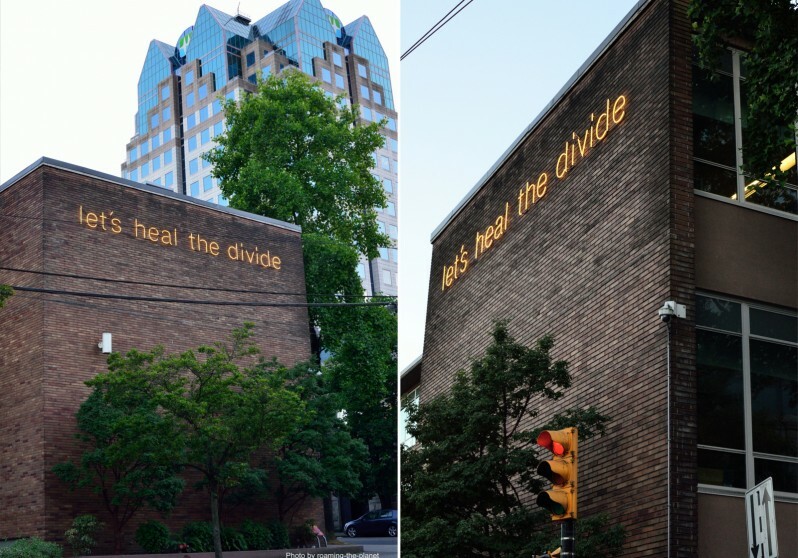 In highlighting the glaring economic disparity between neighbourhoods, the location of this artwork not only acted as an intersection between perceived borders but also marked a physical division between one of the most impoverished postal codes in Canada and one of the wealthiest. VCC was specifically chosen to host this work. In 2015, the college celebrated 50 years of breaking down barriers to learning and renewed its long-standing commitment to community, diversity, and accessibility to education. The artwork prompted us to question the sometimes arbitrary lines that divide us. 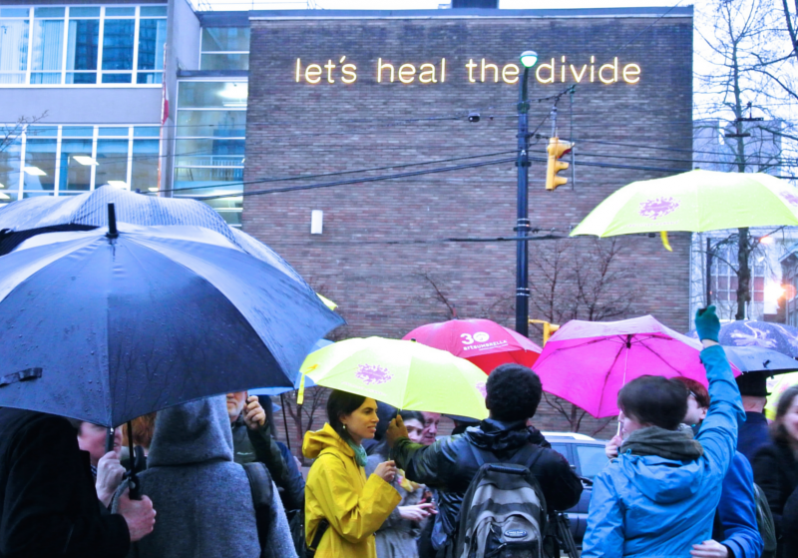 In the spirit of hope, this piece called for action, collective healing, connectivity, and inclusion. 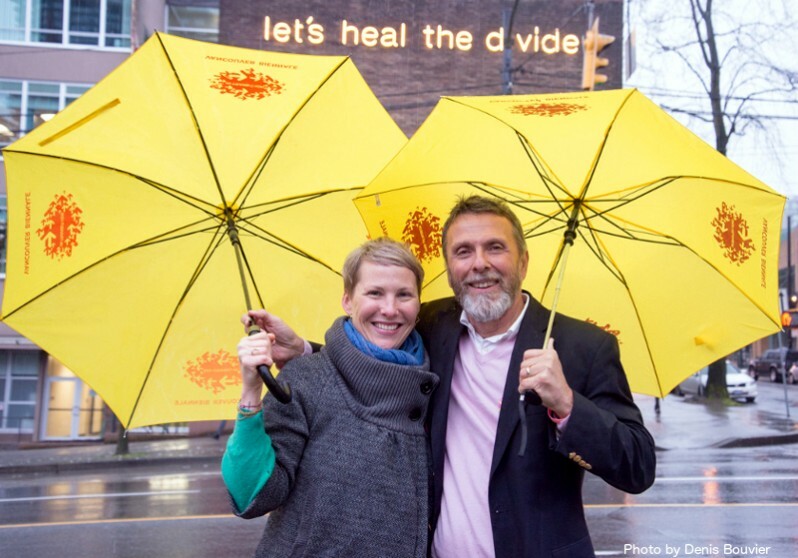 Latour is a two-time Vancouver Biennale artist, with previous work installed at the Brighouse Skytrain Station in Richmond as part of the 2009 – 2011 Biennale. 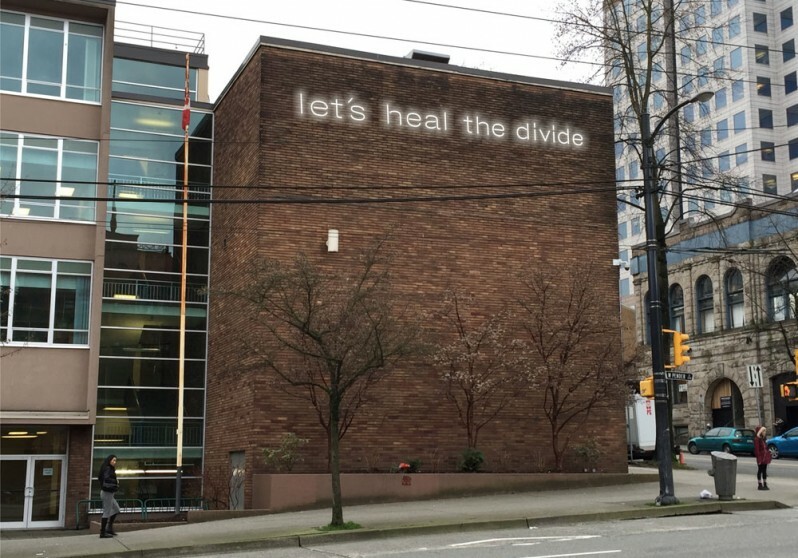 While let’s heal the divide has been removed after temporary installation, a plaque has been mounted in the Vancouver Community College library as a symbol to recognize the impact of the artwork on the community and to continue the dialogue. Watch a series of deeply personal interviews exploring the many divides which this artwork questions.